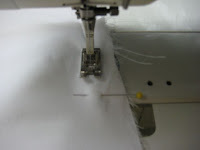 Perhaps you are sewing a bridal or Christening gown or maybe you are altering one. 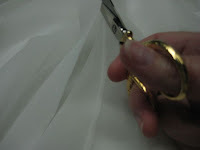 Either way, using a French seam will give you an couture look in a finished garment. I did this recently for my daughter's wedding gown. The fabric was silk chiffon and it was a dream to work with. You just have to think backwards for a few minutes. 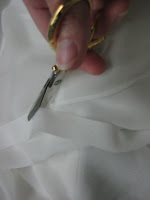 First, make sure the garment fit is perfect. 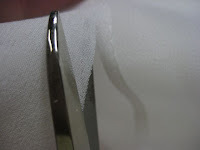 Make a muslin if you need . Begin by sewing the seam wrong sides together, about 1/8" INSIDE the seam allowance. This will make the seam allowance slightly smaller than you need right now. Clip most of the seam allowance away, leaving about 1/8" of an inch. Then open the garment out flat and fold one of the sides of fabric over the tiny seam allowance, to meet the other side of the fabric. You have now sandwiched the raw edges between the two pieces of fabric. Smooth out the seam and stitch again. The right sides are now together, the raw edges are encased in a new seam and the garment has a professional look. Click on the picture below to get a close up view.